TreeSize Professional is HDD space managing software used to analyze disk space, generate tree map, show pie or bar charts, search and find which files has been taking more hard drive space. 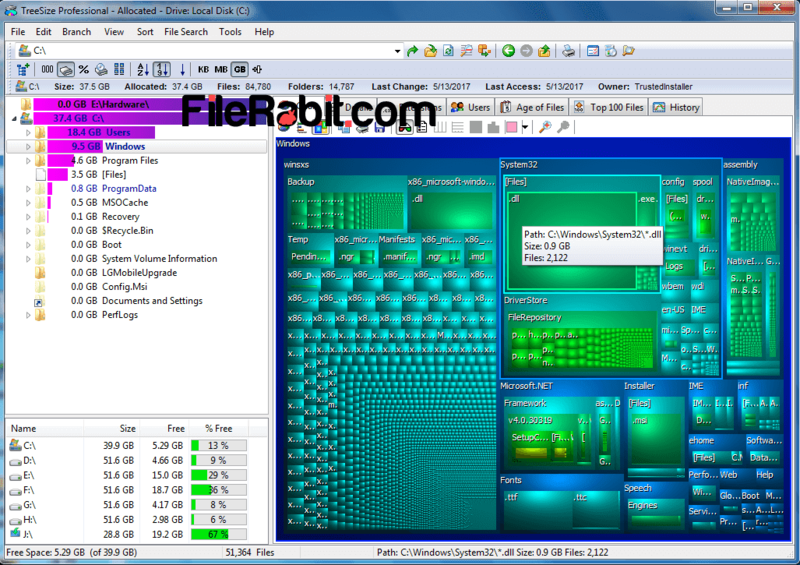 A multi-functional useful utility that can scan whole hard drive, specific partition and folder to get detailed information about sub-folders and files. 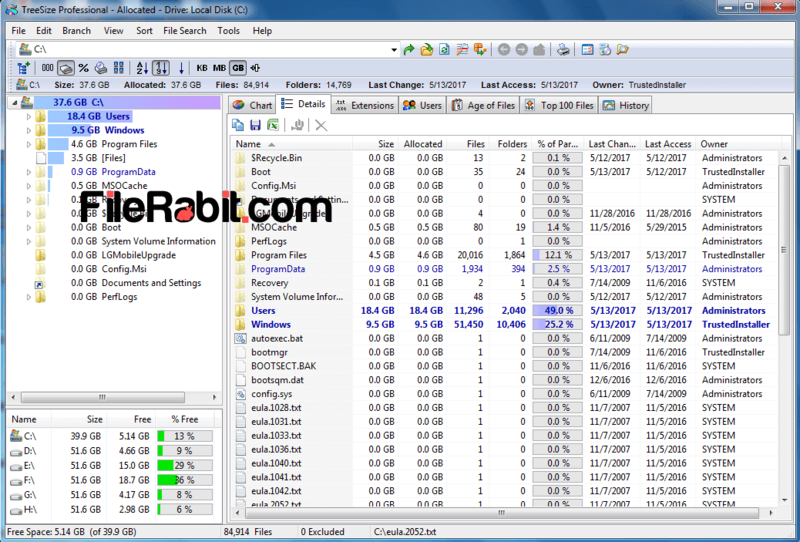 The detail also include size, last access date, files & sub folders, partition size in percent and more. However, TreeSize let us to gather file extensions with sorting them in size or name order. TreeSize professional is flexible space manager that is able to give more free space with analyzing and optimizing HDD. Furthermore, scan external hard drives, memory cards, USB flash drives and other portable mobile devices. Sometimes temp and hidden files will destroy free space with duplicating data without user permission. After scanning target drive, navigate to details and set sort by size to identify which files or folders are bigger than other. Free up more space with deleting unusable files will optimize system speed. Export results in Microsoft Office Excel format to compare with previously saved reports. XLX, TXT, CSV and XML file extensions are commonly support. Taking snapshot alongwith comparing snapshot data with previous snaps. TreeSize also can give horizontal or vertical bar charts. Pie charts are easy to define percentage, data manipulation, structure and more. 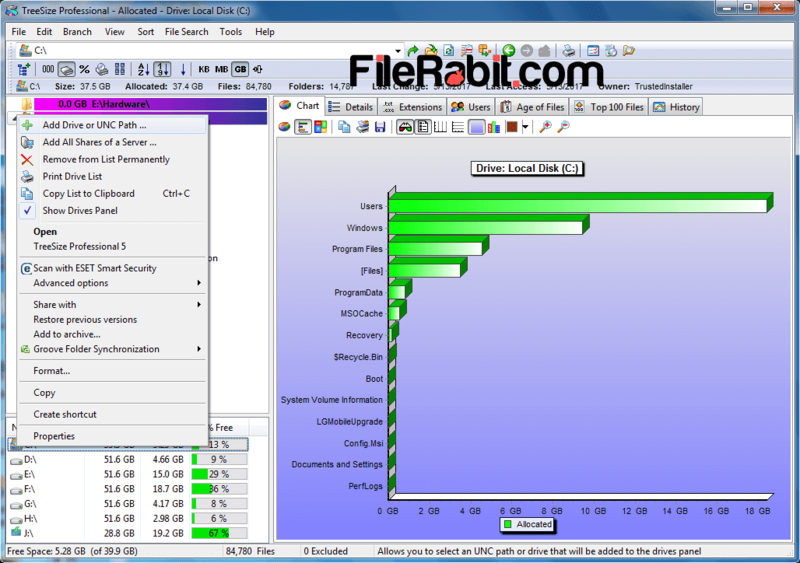 File search feature is an advanced function that can find old, big, duplicate and temp files. These files can be moved, deleted or compressed in ZIP archive file.